After a 19-year-old robber shot and killed LAPD Sgt. Marvin Haney on a busy Wilshire Boulevard sidewalk, it was Haney's widow who eventually saved her husband's killer from a near-certain death sentence. 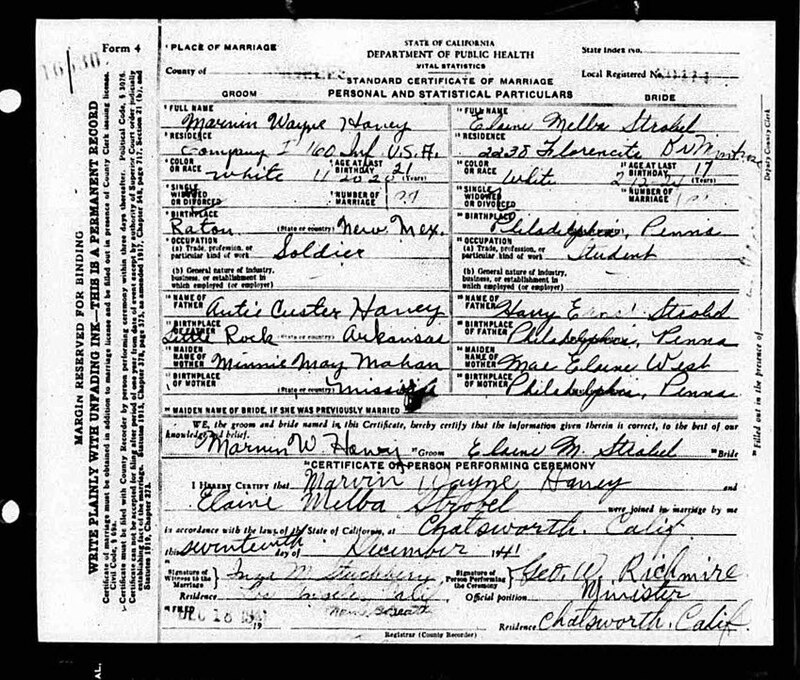 Marvin Wayne Haney was born Nov. 14, 1920, the fifth of six children born to Autie Custer and Minnie Mae Mahan Haney. (An older brother born in 1917 died in infancy.) Autie Haney worked as a railroad brakeman and the family moved several times as the children were growing up, usually to small towns on the rail lines, from De Leon, in central Texas, to Raton, in northeastern New Mexico -- where Marvin Haney was born -- to San Bernardino, California. By 1930, the family had moved to Los Angeles, and was living in a rented house on Glover Place, north of downtown, along the Los Angeles River. In addition to Autie and Minnie Haney and their four youngest children, the house also contained Autie's widowed mother, his sister, a son-in-law and a grand-daughter. Their oldest child, Autie Jr., was living in Indio, in Riverside County, California, where he was working as a cook in a restaurant. Marvin Haney attended Benjamin Franklin High School, where he was a member of the art and drama clubs, and performed in several school plays before graduating in 1939. On March 3, 1941, with the United States inching closer to involvement in World War II, 20-year-old Haney enlisted in the Army, listing his occupation as commercial artist. Ten days after the Japanese attack on Pearl Harbor on Dec. 7, 1941, Haney, who had been assigned to the 160th Infantry Regiment, married his girlfriend, 17-year-old high school student Elaine Melba Strobel, in Chatsworth, California. Haney was discharged from the Army as a second lieutenant, and joined the LAPD on Nov. 18, 1944. Within a few years, Haney was promoted to sergeant in the Accident Investigation Division, and was working traffic in the Wilshire Boulevard corridor. Shortly before 9 p.m. on Friday, Feb. 15, 1952, a 19-year-old man walked into Lloyd's Market at 863 S. Vermont Ave., about three blocks south of Wilshire. The man announced a robbery, flashed a gun, and took $172 from the owner of the market, William Lord. The robber stuffed the cash into a paper bag and left the market, walking north on Vermont. 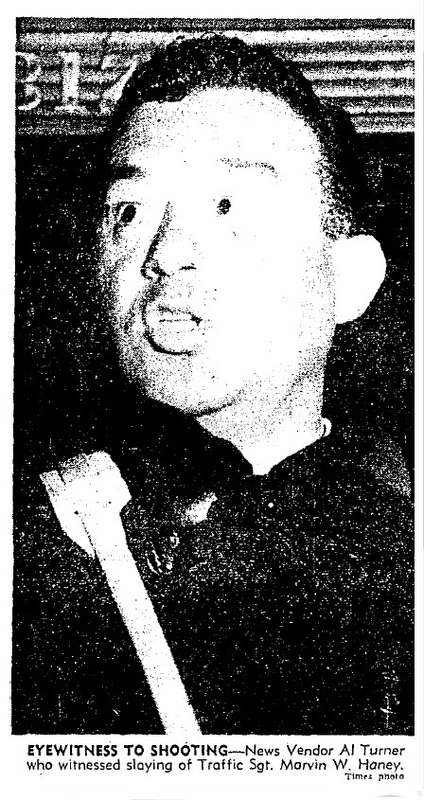 Haney was alone in his patrol car on Wilshire when he heard the report of the robbery, and the description of the robber. At the intersection of Wilshire and Vermont, he noticed a man fitting the description, pulled his car to the curb, and got out. Haney approached the man and said, "Wait a minute," but the man turned and started to run, with Haney chasing him. Shouting at the man to stop, Haney fired two warning shots into the air, according to witnesses. The man stopped, turned and fired one shot at the officer, hitting him in the hand. "The two just stood there, staring at each other for a moment," said Alphonso Turner, a newspaper vendor and witness. Haney finally shouted to the other man, "Drop that gun! Drop that gun!" "Apparently, he wanted to give the kid another chance, even after he had been fired upon," Turner said. "But the kid fired again." The robber's next shot hit Haney in the chest and pierced his heart. Before he fell, Haney was able to fire two shots at the fleeing robber, hitting him in the right knee and the right side, below his arm. The wounded man ran west on Wilshire, then south down an alley between Vermont and New Hampshire Avenue. Haney died on route to the Georgia Street Receiving Hospital. He was 31 years old. After the shooting, more than 200 police officers and detectives launched an intensive house-to-house search of the neighborhood, and found the gunman about an hour later and less than two blocks away, hiding next to a dog house behind a boarding house at 677 S. New Hampshire. In his pocket, they found the gun he used to shoot Haney. The paper bag containing the $172 taken in the market robbery was found nearby. Haney's killer was also taken to the Georgia Street Receiving Hospital for treatment of his injuries, then transferred to the General Hospital's prison ward. Further investigation revealed that the man was responsible for two other recent armed robberies in the area. He was charged with murder and three counts of robbery, and held without bail. Haney's funeral services were held on Feb. 19, at Utter-McKinley's Wilshire Chapel, 444 S. Vermont Ave. -- two blocks north of the scene of the shooting. The services were attended by more than 1,000 mourners, including L.A. Mayor Fletcher Bowron, LAPD Chief William Parker, Haney's widow and young daughter, his parents, and his two brothers and two sisters. It took nearly 40 minutes for all of the mourners to file past Haney's coffin. The procession from the chapel to Forest Lawn Memorial-Park in Glendale was escorted by 150 police motorcycles and the American Legion Police Post motorcycle drill team, and included more than 300 cars, including more than 100 police cars from the LAPD and other departments in the area. Los Angeles Police Chaplain Fred Sauer delivered the eulogy. "He served his country as a lieutenant during time of war," Sauer said, "and he gave his life during time of peace. ... There was so much for him yet to do. But he was shot down in the line of duty by an enemy of society and he died a hero, as much a hero as though he had fallen on the field of battle." Military services were conducted at Forest Lawn's Church of the Recessional. In addition to his widow, Haney left two young children -- a 9-year-old daughter, and a son who turned 2 years old a week after his father was buried. Haney's killer confessed to the shooting when he was captured but, during the initial stages of his trial, he attempted to plead not guilty by reason of insanity, and also that he shot Haney in self-defense after Haney shot first. He later dropped those pleas, and pled guilty to murder and the three robberies. Before he was sentenced by Superior Court Judge William B. Neely, Haney's widow, Elaine Haney, said that she was opposed to the death penalty, and asked that the life of her husband's killer be spared. "A very unusual thing has happened in this case," said Deputy District Attorney Abraham B. Nathanson, who prosecuted the case. Nathanson said LAPD Chief William Parker, Deputy Chief Thad Brown and other department officials and officers who would normally urge the death penalty for anyone found guilty of killing a police officer offered no opposition to Mrs. Haney's request. "I am very deeply moved by the position of Mrs. Haney in this case," said Judge Neely. "The attitude of the police officers which reflects a willingness to avoid resentment over the fate of an officer who forfeited his life in carrying out his duty also reflects credit upon them. "I have no sympathy with the defendant whatsoever," Neely added. "He could have surrendered to Sgt. Haney if he had not placed such a high price on such material things as the money and his personal liberty." Following Mrs. Haney's wishes, Neely sentenced Haney's killer to life in prison. 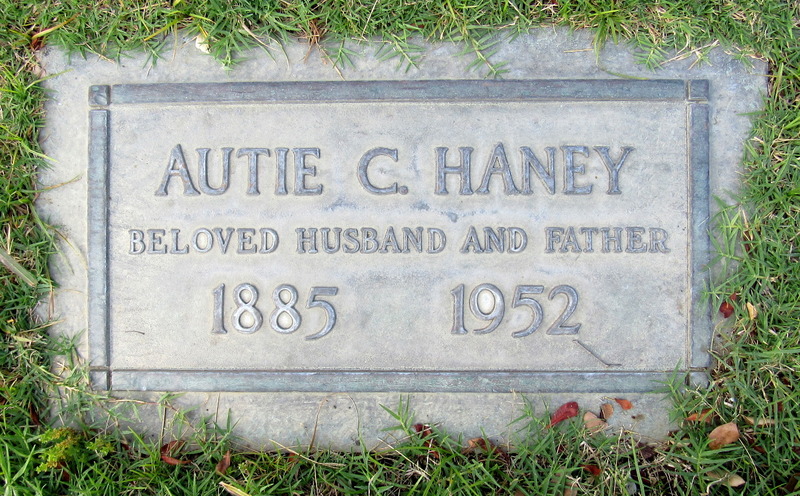 Haney's father, Autie Haney, died on April 20, 1952, two months after the death of his son. 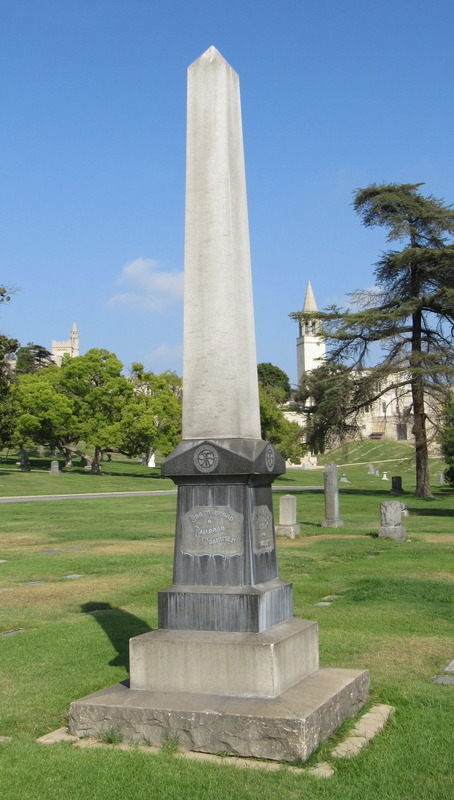 He's buried at Forest Lawn in Glendale, near the Brotherhood of Railroad Trainmen memorial. 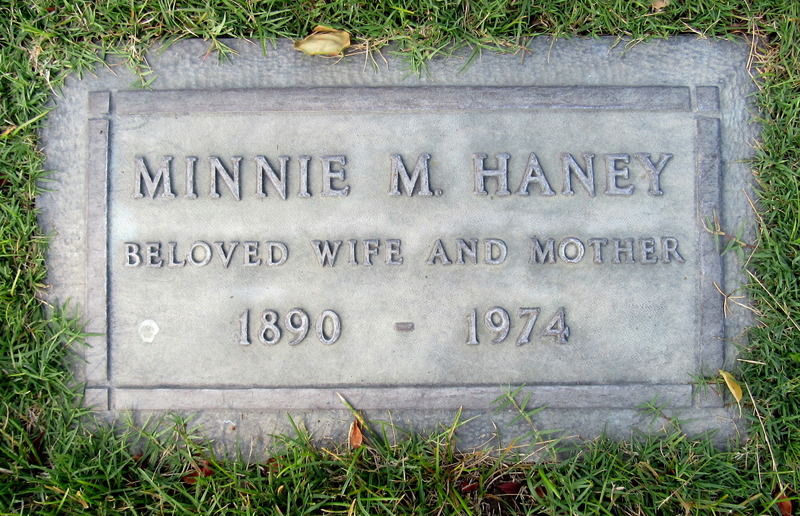 Haney's mother, Minnie Haney, died in 1974, and is buried next to her husband. 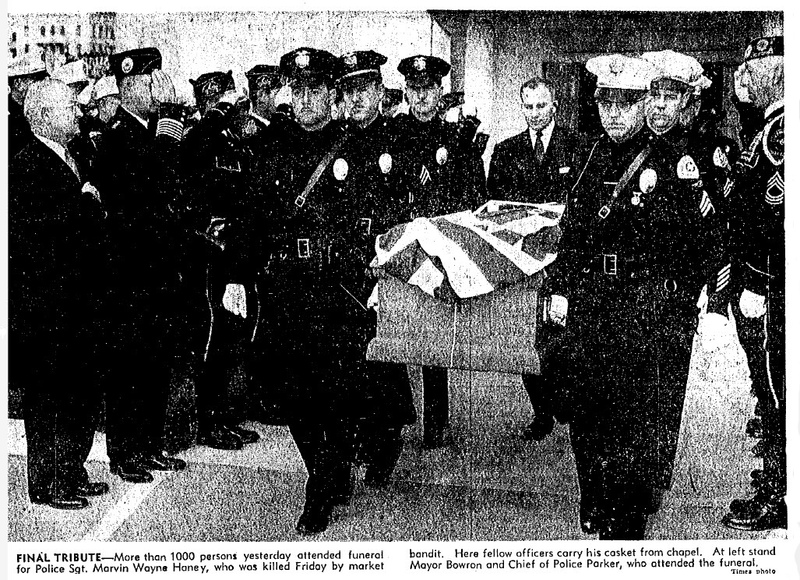 In 1953, Haney was posthumously awarded the LAPD's Medal of Valor -- the department's highest honor, awarded to officers who distinguish themselves by conspicuous bravery or heroism above and beyond the normal demands of police service. Sgt. Haney's sign is located on the northwest corner of Wilshire Boulevard and South Vermont Avenue.